We’ve just spotted that the lovely people at John Lewis Branksome have included us in their quarterly Community Matters Scheme at the front of the store. Every 3 months John Lewis customers nominate 3 community groups to help. And this quarter it’s Dorset Mind, Dorset Wildlife Trust and the Grove Hotel in Bournemouth. 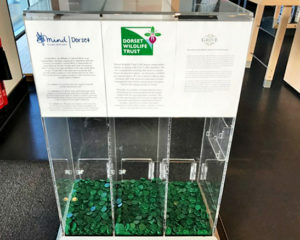 John Lewis customers then decide how much each nominated group receives, by using a token to vote for the organisation they’d like to support. Each shop has £3,000 to donate – split between the charities according to the proportion of the vote they’ve received. This means that if a charity receives 31% of the votes, it receives a £910 donation. The share of the green tokens looks evenly split right now – but there’s still time to vote for us. By donating your token to Dorset Mind, you will directly help local people in Dorset with mental health problems. You can find the ‘Home’ store at Branksome – see the link here for opening hours and location. You can also shop online via their main website.